This item is taken from the ECRA Bulletin for July 2013. The photo below shows the four different rounds of the US cal .90 series in order (T1 to T4), designed for four different guns with the same designations. The T4 round is commonly available to collectors but the others are scarce. There is a complicated but still incomplete story behind their development. The principal source of information is Chinn’s The Machine Gun (Vol I, pages 607-609), which describes the operation of the T1 and T2 in detail, briefly mentions the T3 but curiously makes no mention of the T4. Vol III of Chinn’s work (page 30) briefly mentions all four guns. I also have an undated draft report headed The Caliber Ninety Aircraft Gun by Charles K Cabeen, who appears to have been a student at Lafayette College in Easton, Pennsylvania, with access to official documents concerning this programme. 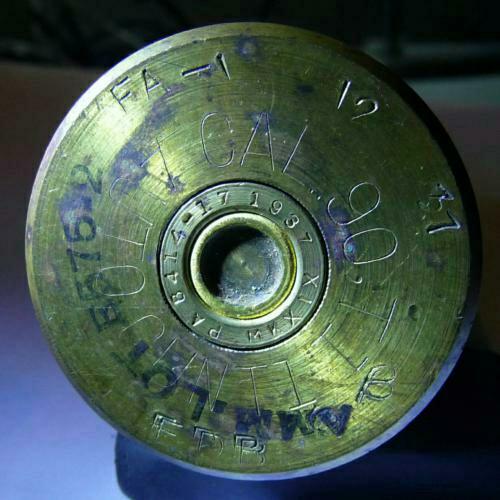 A brief official data card about the T4 ammunition was reproduced in the IAA Journal Issue 491 (May/June 2013, page 31). Finally, Bill Woodin provided much helpful information in a follow-up to my original ECRA article, including references to Ordnance Committee Minutes. What follows is a summary of the development of the guns and ammunition described in these sources, which are not entirely consistent. The inspiration for the development of the guns was the realisation in the mid-1930s that as aircraft became bigger and stronger, automatic cannon of 20+mm calibre would be needed to arm future generations of fighter aircraft. There were difficulties in obtaining samples of such guns then being made in Europe so it was decided that the Ordnance Department should design and develop a gun in collaboration with the Air Corps (USAAC, to which USAAF personnel belonged). In March 1937 the desired characteristics of the weapon were listed by Ordnance, including a calibre of .90 inch (23mm), a muzzle velocity of at least 2,850 fps (869 m/s), and a rate of fire of 130 rpm (astonishingly low, considering that European cannon in this class were already achieving rates two to three times higher). Gun weight was not to exceed 125 lbs (57 kg) and a 50-round magazine was specified, to weigh 20 lb empty and 32 lb full (9 kg and 14.5 kg respectively). There is no comment on the selection of the .90 inch calibre, but it might have been prompted by the existence of the 23mm Madsen aircraft gun, an example of which was tested in the USA at around this time. The first effort, the T1, was designed around a 23x146SR cartridge, based on a shortened and necked-down 1.1 inch AA gun cartridge case. It therefore had a rim diameter of 43.5mm and a maximum body diameter of 41mm. Chinn states that the gun used a long-recoil mechanism, had a “flat drum” (presumably a pan) 50-round magazine, weighed 205 lbs (93 kg) with a loaded magazine and fired at 150 rpm. An official source refers to the gun action having been based on the Browning 37mm AA gun, which confirms that it was a long-recoil type (Colt did suggest in October 1938 scaling-up the Browning short-recoil action of the .50 cal MG instead, but this was not accepted). It was made by the Rock Island Gun Arsenal. The weight of the T1 was excessive and the rate of fire poor, so a second attempt was made, with initial design studies being completed by January 1938. For this and subsequent designs the required muzzle velocity was reduced to 2,700 fps (823 m/s), enabling a smaller cartridge to be developed. The basic shape, 29.1mm maximum body diameter and 139.5mm length of the T2, T3 and T4 cases are the same, except that the T2 has a rebated rim of 24.0mm while the other two are semi-rimless, with a rim diameter of 30.7mm. 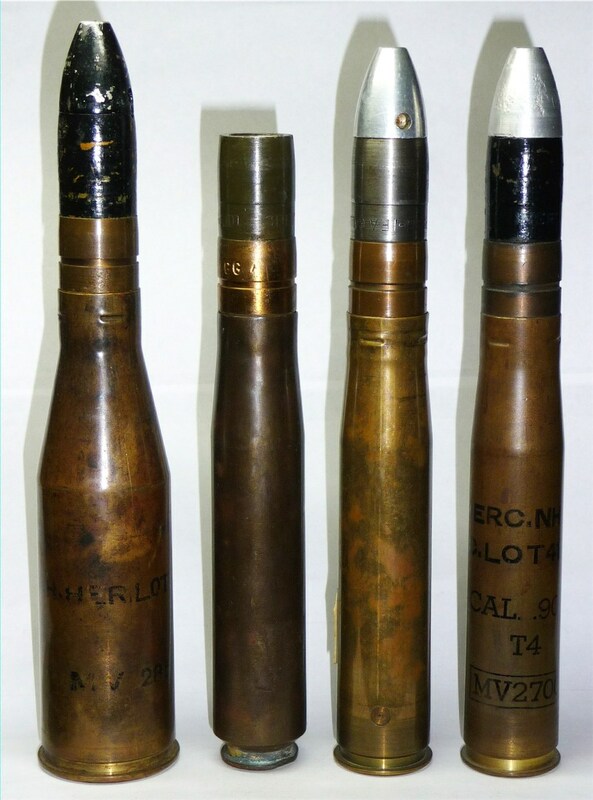 All four T-series rounds were loaded with the same projectile, an HE-T type weighing 0.45 lbs (204 grammes) which was 100mm long (including a small-diameter protruding tracer element) of which some 77mm protruded from the case. These projectiles were inert-loaded and fitted with a dummy fuze. In addition, examples exist of a pointed (presumably AP) projectile and a flat-nosed proof shot. The T2 gun design, made by the Watervliet Arsenal, was based on the 20mm Oerlikon API blowback guns, but there is a direct conflict in the descriptions of the mechanism given by Chinn and Cabeen. 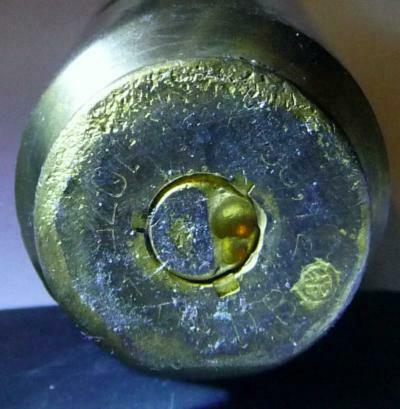 Chinn states that it was a simple blowback without the Oerlikon’s advanced primer ignition feature, and thereby required recoiling parts weighing 47 lbs (21 kg), leading to a total gun weight of some 240 lbs (109 kg) without the 48-round ammunition drum. However, Cabeen states that the T2 used a differential recoil mechanism (a.k.a. 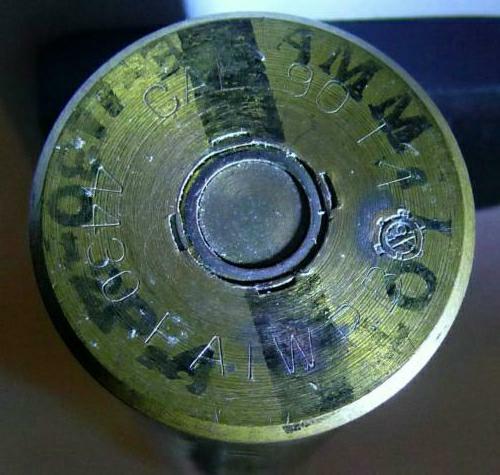 API blowback) and I believe that he is probably correct, for two reasons: first, the rebated rim used by the T2 cartridge is required for Oerlikon type API blowbacks but not for a straight blowback; second, Cabeen specifies that the cartridge was fired while still 0.6 inches (15mm) from the bolt’s fully-forwards position, again consistent with API. Furthermore, the rate of fire of 400-450 rpm stated by Chinn would have been impossible for a simple blowback to achieve because of the massive weight of the bolt, so either his description or the rate of fire must be wrong. It has since emerged that there was another variation in the case type, the T2E1 which was identical to the T2 except for having a rimless instead of rebated-rim design. This is curious as it is incompatible an API blowback gun mechanism. Possibly the gun mechanism was modified at the same time as the ammunition, but subsequent reports have confused the two. Of the T3, also made by Watervliet, Chinn only states that it was very similar to the T2 but included a “blowback retarding device”. 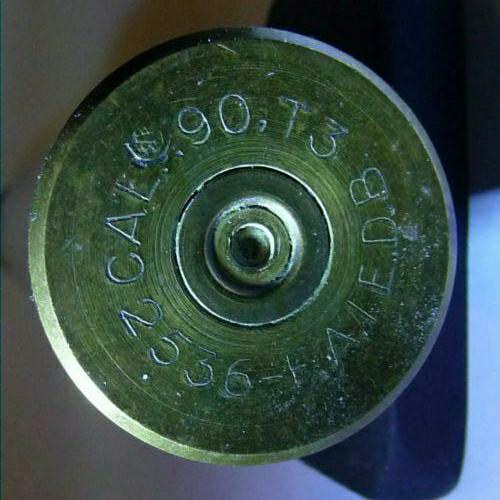 Cabeen states that it fired while the bolt was still 0.125 inches (3.2mm) from its forward position, and the use of a semi-rimmed case is not inconsistent with this. Cabeen also states that the T3 used “counterrecoiling hydraulic buffers” to check the forward motion of the bolt. It seems possible that Chinn’s information about the T2 has been mixed up with the T3, since he did not seem to think that there was any significant difference between them, whereas Cabeen’s description and the shape of the cartridge cases suggest otherwise. One curious point concerning the cartridge, and the only visible difference between the T3 and T4 rounds apart from the headstamp, is that the primer of the T3 has an inner ring more characteristic of an electric type, but there is no mention of electric priming in either source. The T1 also has a rather unusual primer. The T3 gun was presumably not successful as nothing more is heard of it, while Watervliet continued work on the T2 with a new lightweight version, possibly the one referred to as the T2E2, which Cabeen states was 99% complete by the end of March 1942, at which point work seems to have stopped. Finally, the T4 gun, while using basically the same ammunition as the T3 was, according to Chinn and Cabeen, developed by Colt and based on the design of the Browning 37mm M1A1 long-recoil cannon (thereby reverting to the T1 operating principle). It was designed to use either flat ammunition clips or a flexible belt in a drum (presumably like the 37mm M4 aircraft gun). However, by the time it was tested in March 1941 it was being proposed for use as an anti-tank gun (as shown below). No further work on T4 seems to have been done after this date. Neither source gives any performance or weight information concerning T4 or T3. All of the .90 series guns were designed by the Ordnance Department and it appears from official Ordnance Comittee minutes that work on them proceeded in parallel rather than sequentially: design and manufacture of a prototype T1 was approved in April 1937; similar work on both the T2 and the T3 was approved in February 1938; and Colt was discussing with the Ordnance Department work on the T4 in October 1938 (with manufacture of a prototype approved in 1939). The entire .90 series seem to have been poor performers compared with European contemporaries, being overweight and slow-firing. They showed the inexperience of the US Ordnance Department in designing automatic weapons at that time. The bases of the four cartridges in my collection are shown below. As well as the letters and numbers, there is a small “crossed cannons” symbol (which I presume represents the US Ordnance Department) on all of them. Any further information concerning the guns and ammunition which anyone can add to this rather confusing account will be much appreciated.